UChiVotes is a student-led, non-partisan voter engagement initiative founded out of the Institute of Politics in August 2018 with the goal of boosting voter turnout and engagement on UChicago’s campus. In the November 2018 midterm elections, we aimed to boost student registration to 70% and turnout to 40%. While we await final data on UChicago’s turnout rate, UChiVotes helped the University of Chicago take the top spot in TurboVote’s national rankings with over 80% of undergraduates registering to vote. 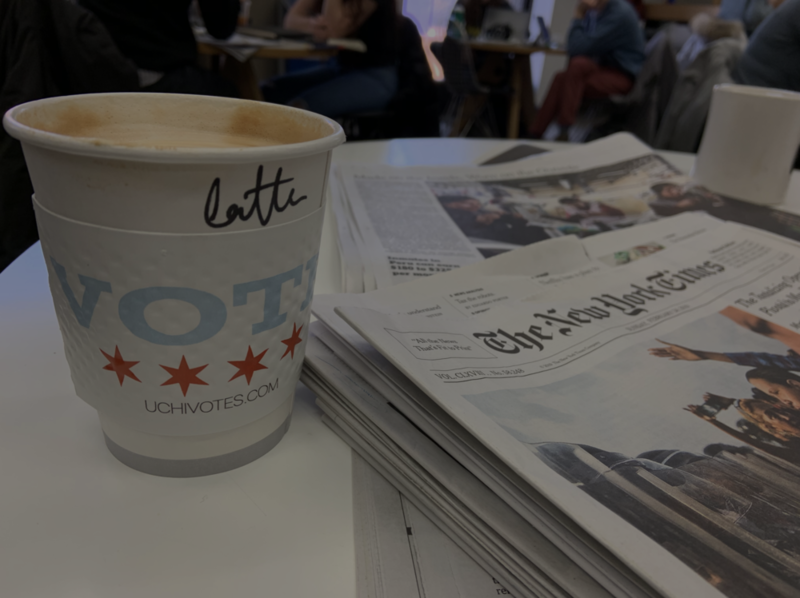 In the lead-up to Chicago’s municipal elections, we focused on ensuring that those who wanted to engage with the elections knew how to vote and had the information about the issues and candidates necessary to make an informed choice about the future of the city. Now, UChiVotes turns its attention to the 2020 primary and general elections—and the remaining races across the country in 2019. Kentucky, Louisiana, Mississippi, New Jersey, and Virginia are all holding elections this fall! Make sure you’re signed up for election updates. Shoot us a message to join the UChiVotes team. Here’s the team that helped make UChiVotes’ efforts during the Chicago municipal elections a success. A yard sign points students to UChicago’s first-ever early voting location on campus. The success of UChiVotes’ efforts to turnout UChicago students in the November 2018 midterm elections was made possible by the unwavering support of Institute of Politics staff and the creativity and tireless efforts of our inaugural team. Here are some of the student leaders who made it possible. Website by Dylan Stafford and Katherine Clement ‘20.